These light, crisp desserts are flaky and just sweet enough. I find that desserts, low-amine or not, are often much too sweet for my tastes. This recipe has no added sugar, and lets the fruits speak for themselves. Thaw phyllo dough, and set oil aside in a small ramekin with a pastry brush. 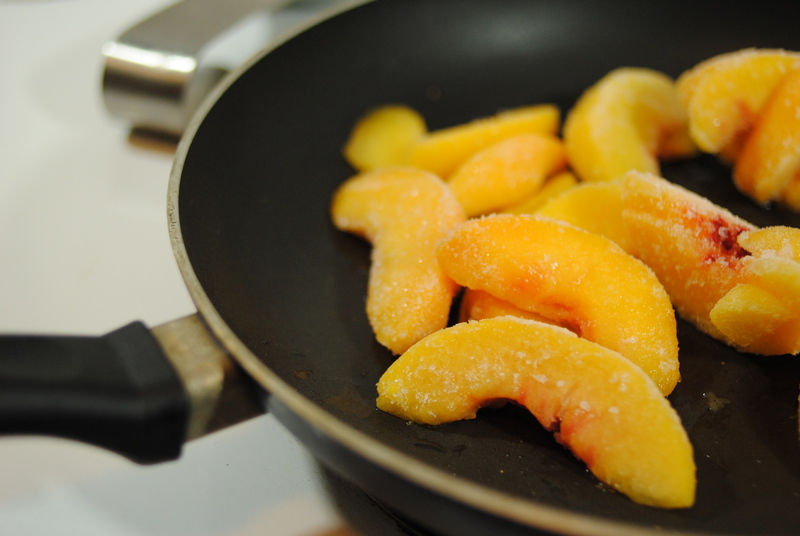 Add cut peaches to pan with water and cook, covered, on medium. 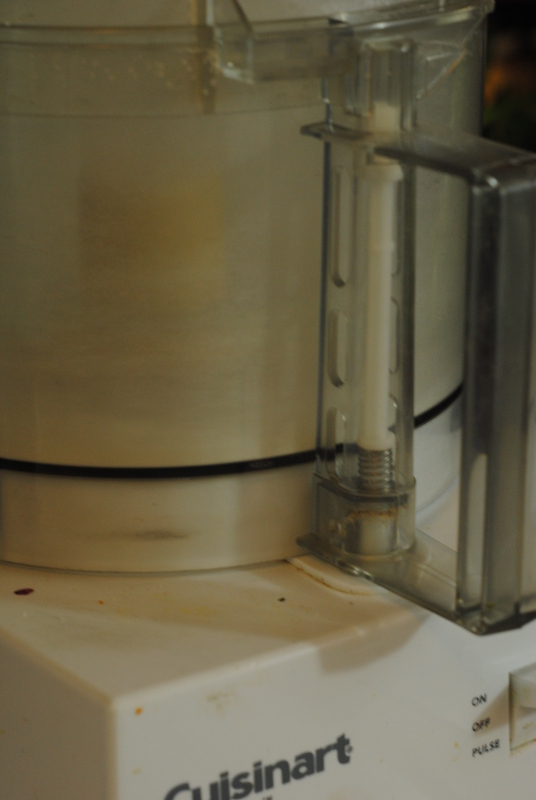 Once peaches are broken down (about 10 minutes), mash. Mash peaches. Also, this is the most AMAZING masher I have ever owned. Get one if you don't already have one. You'll love it. Add nutmeg, cinnamon, and pears. Continue to cook, covered, on medium low, until pears have softened (about 15 minutes). 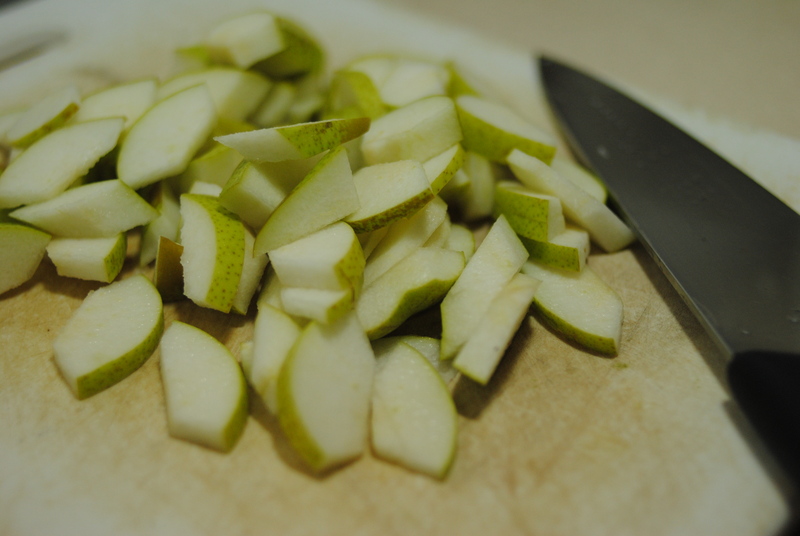 Cut low-amine pears into small, thin pieces. 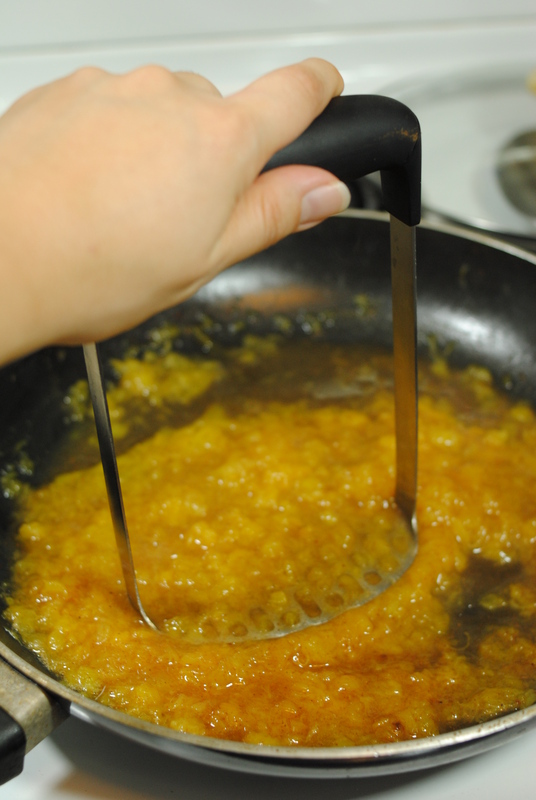 Stir often to prevent burning. Once fruit is softened, remove from heat and allow to cool. 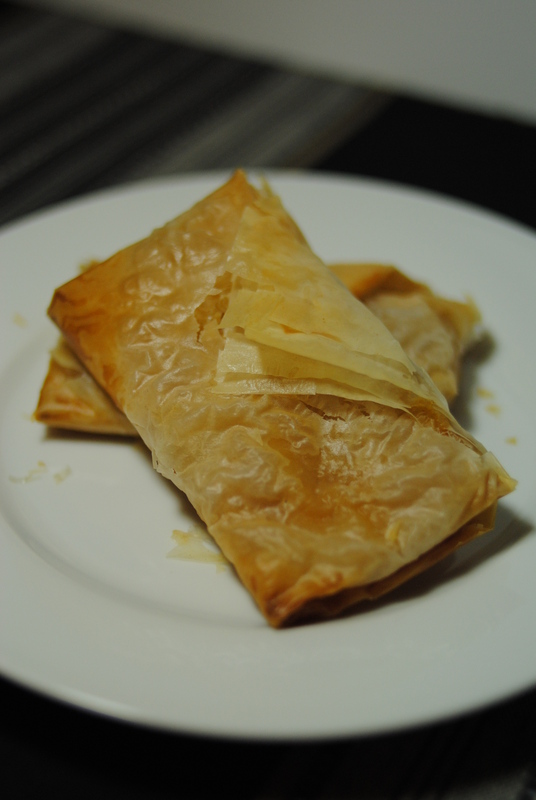 Each pastry will require four squares of phyllo each. 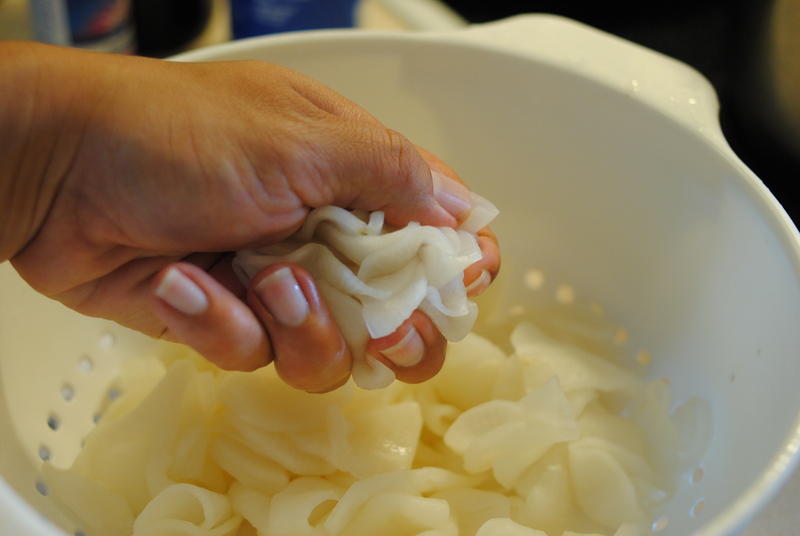 Brush a light layer of oil between each layer of phyllo dough. Add about 1/4 C peach/pear mixture in to the phyllo square in the bottom left corner, toward center. 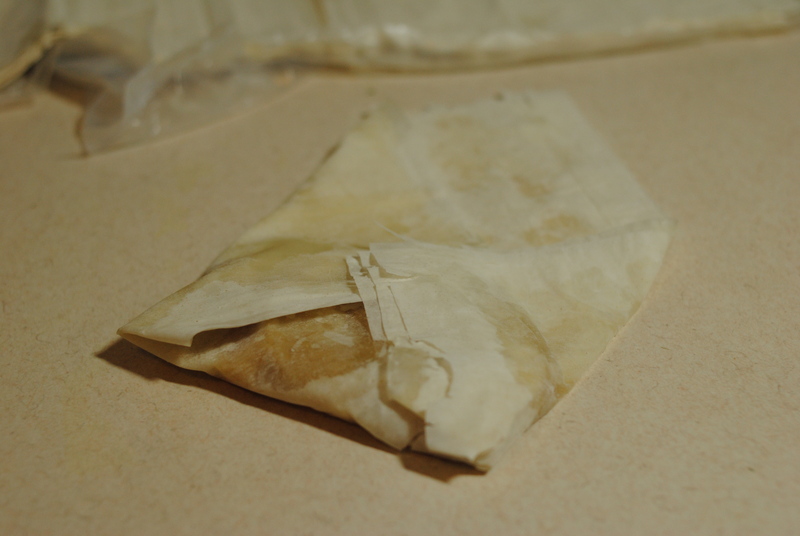 Fold it into an envelope, and seal shut with a little oil. Pear and peach mixture in the phyllo dough square. Fold bottom up, then sides in, and finally, fold top over. 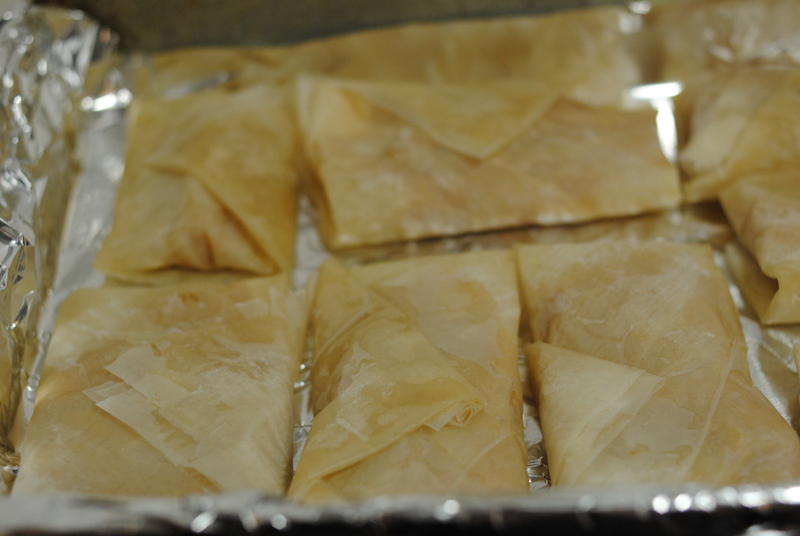 Folded low-amine peach and pear phyllo pockets. 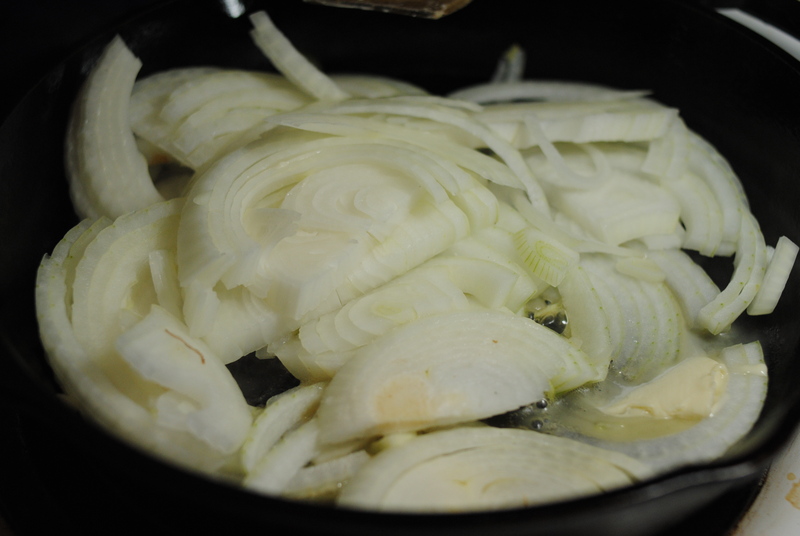 Arrange on a pan that’s been lightly greased. Bake for 20-30 minutes, or until crisp and golden brown. Serve warm. 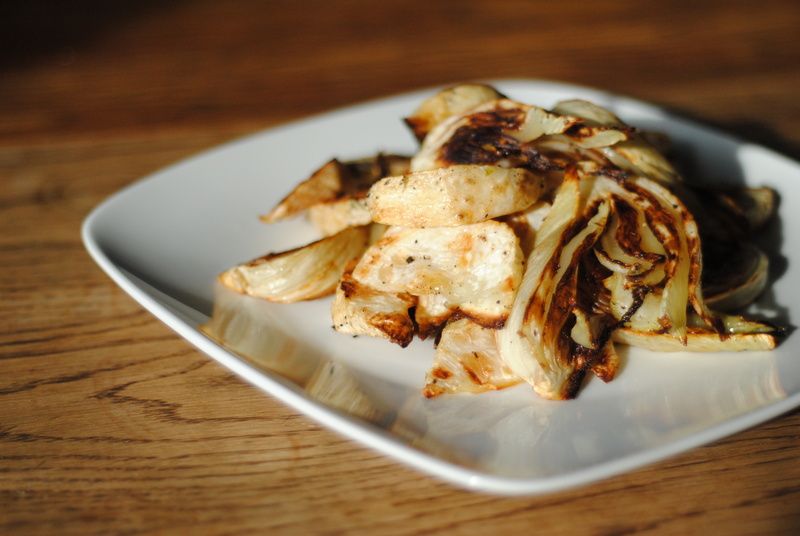 Low-amine roasted fennel and celery root. 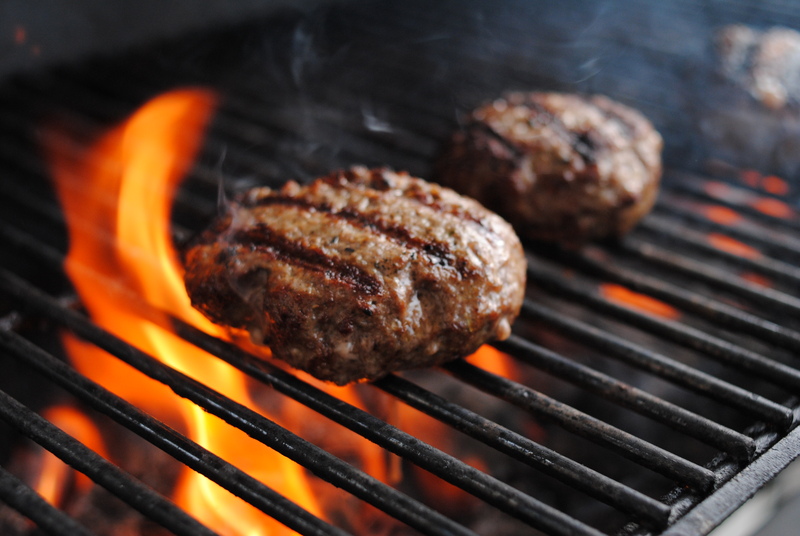 Use 1 Tbsp oil to grease a cookie sheet. 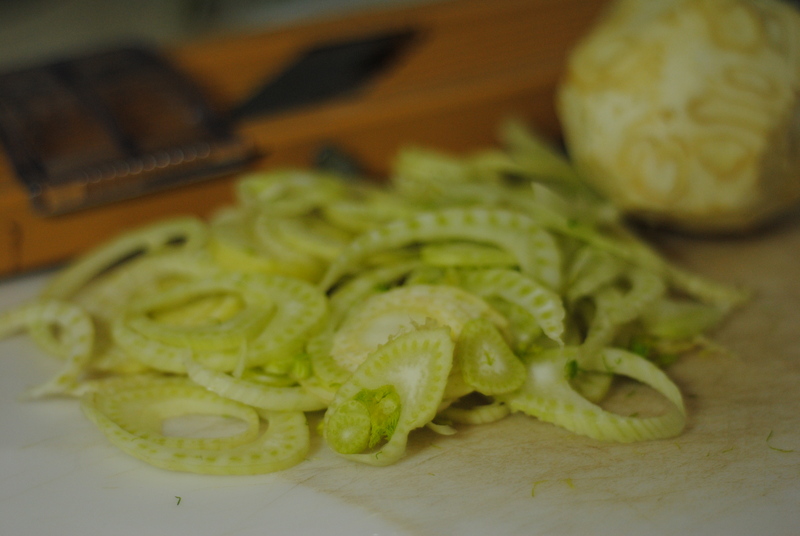 Cut off stems from fennel, and peel celery root. 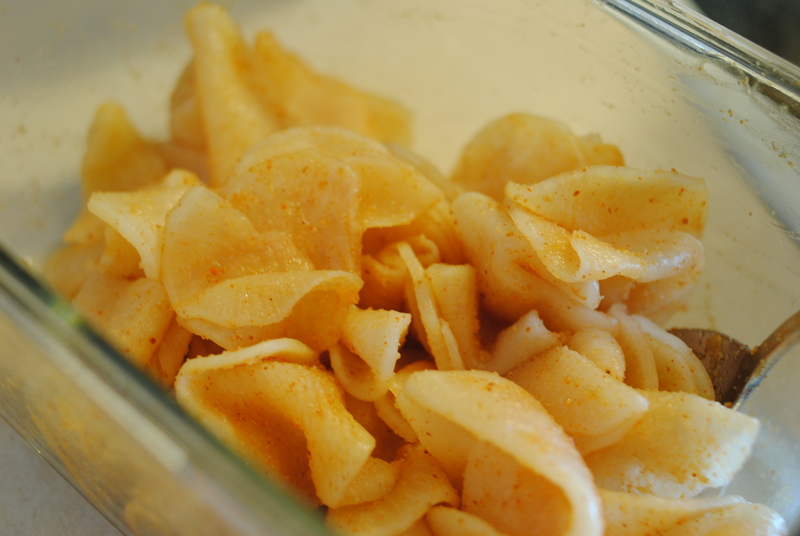 Cut fennel and celery root in half lengthwise. 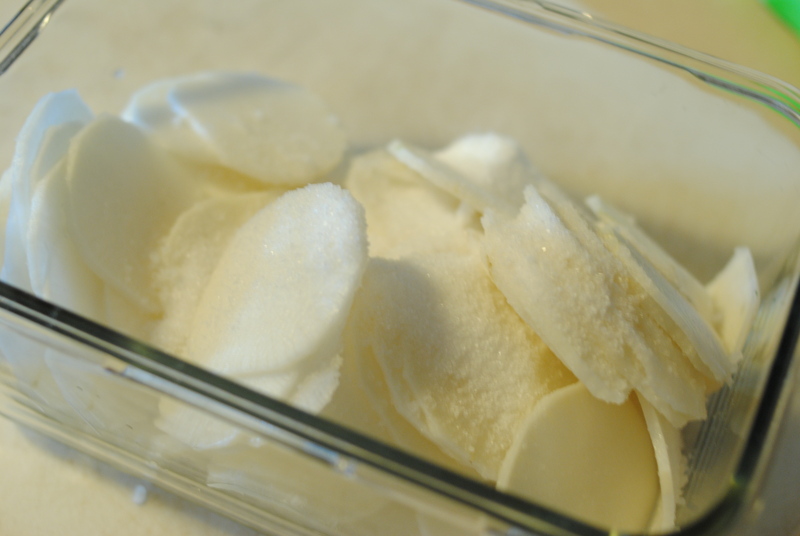 Cut into wedges like apple slices and toss them in a bowl with 2 Tbsp oil, salt, and pepper until well-coated. Lay out pieces on the cookies sheet. 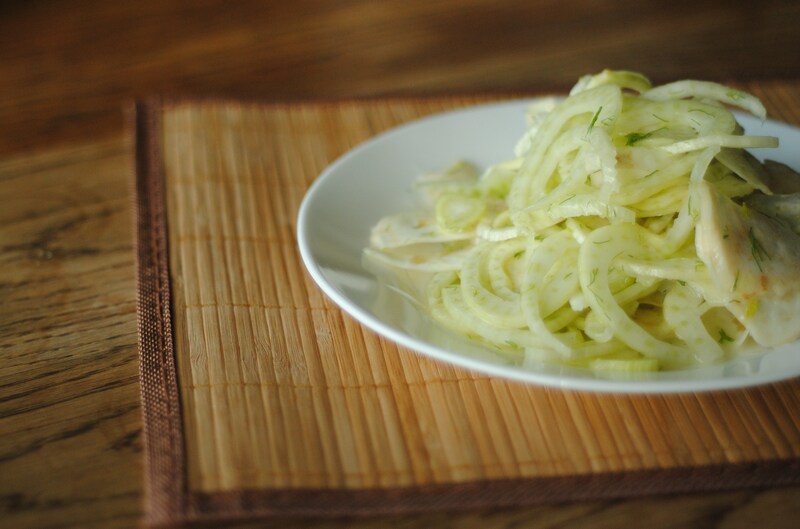 Low-amine fennel and celery root. Roast at for 10 minutes, then flip. Roast for 6 minutes on the other side. 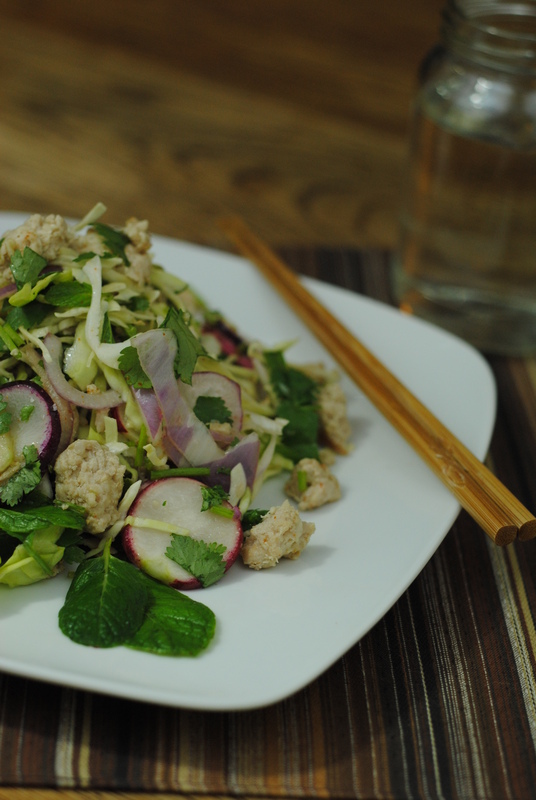 This simple recipe is light and satisfying. 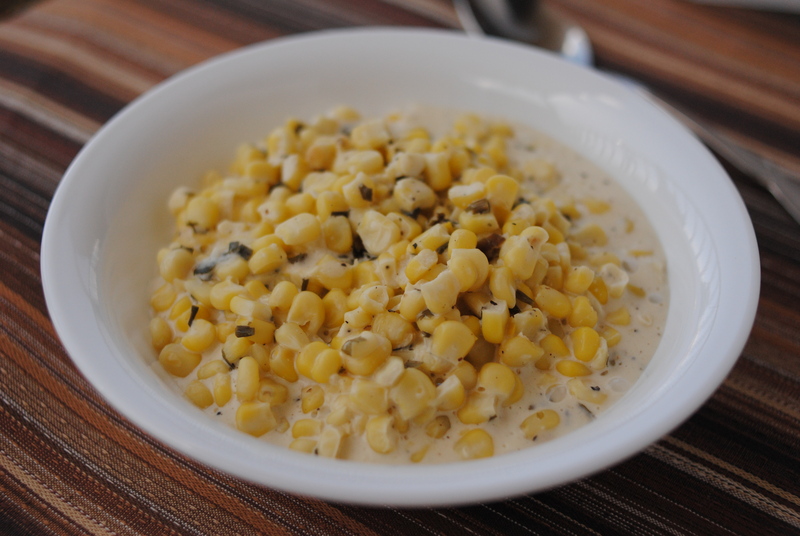 It will brighten meals up with its crisp texture. I enjoyed the light citrus flavors with the added fennel frisse. 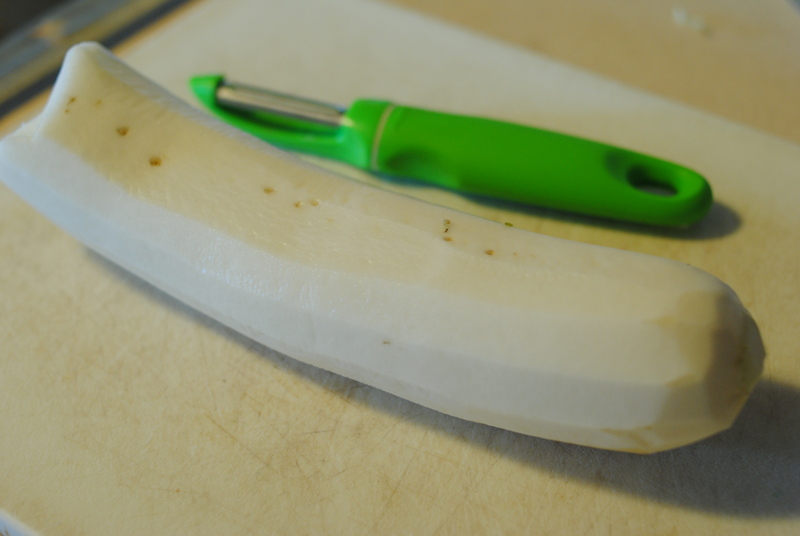 Peel celeriac and cut into quarters (perhaps the only vegetable I ever peel!). 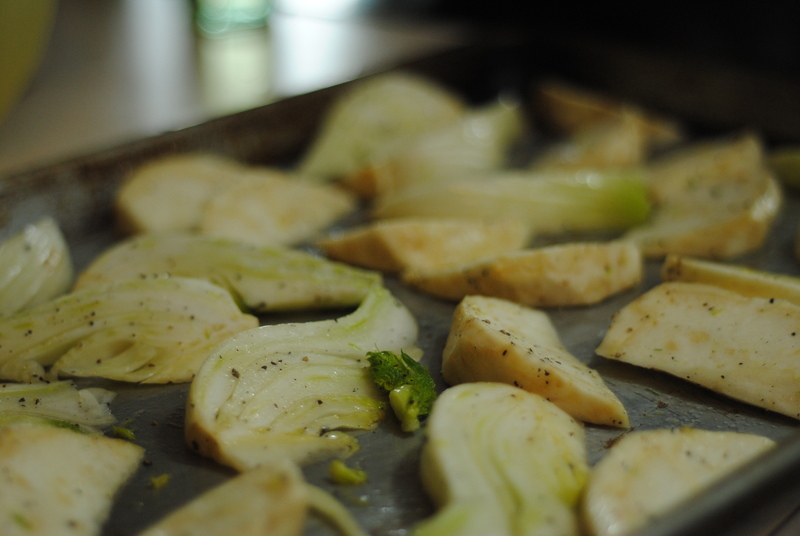 Using a mandoline on a thin setting (if you have more time to marinate the fennel and celeriac, a bit thicker is okay, but if you don’t… the thinner, the better), slice fennel and celeriac. Put into a bowl or Ziplock bag. 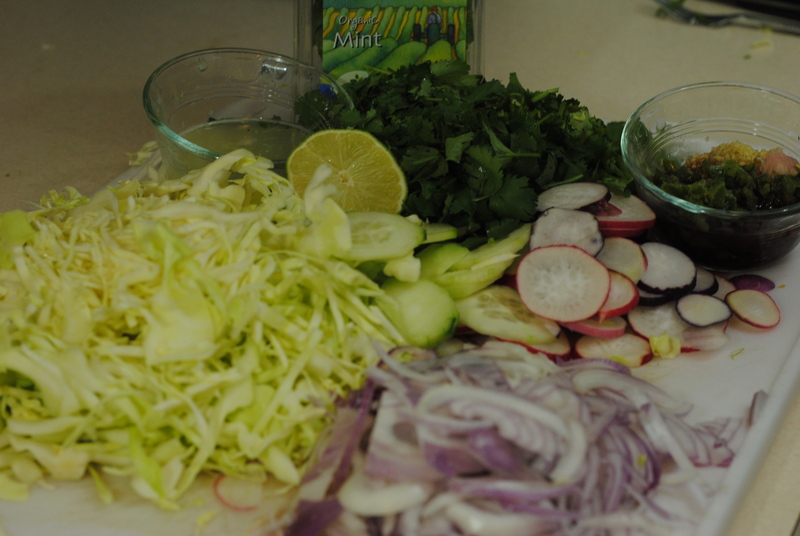 Add ascorbic acid, oil, lime, and sugar. 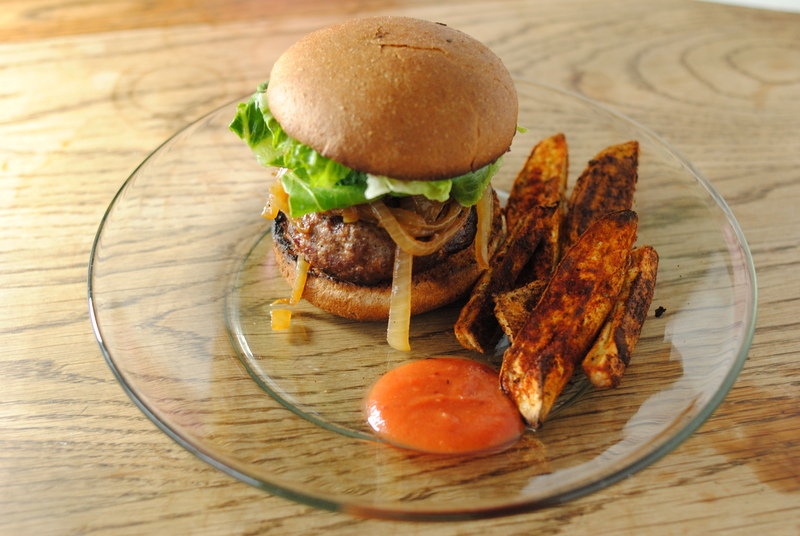 If you want a bit more fennel flavor, add more fennel frisse. 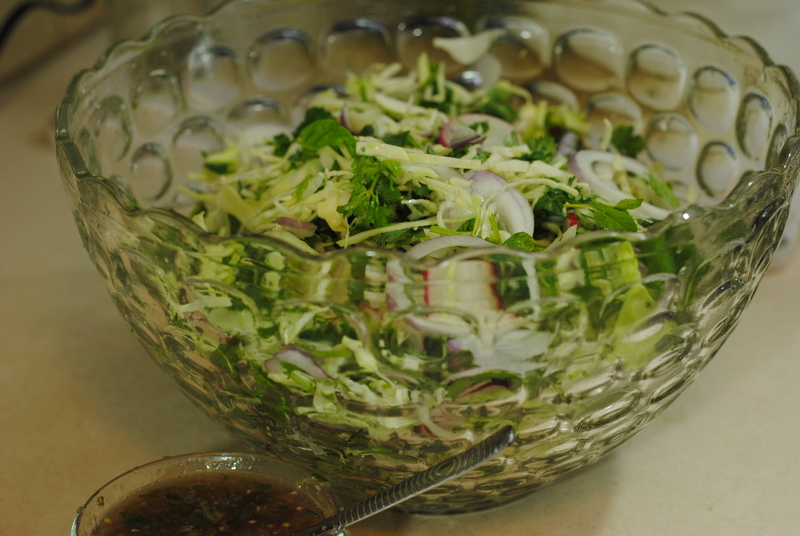 Mix well, and marinate for at least 30 minutes. If you can eat bacon or prosciutto, for the love of god, crumble some up into this recipe. 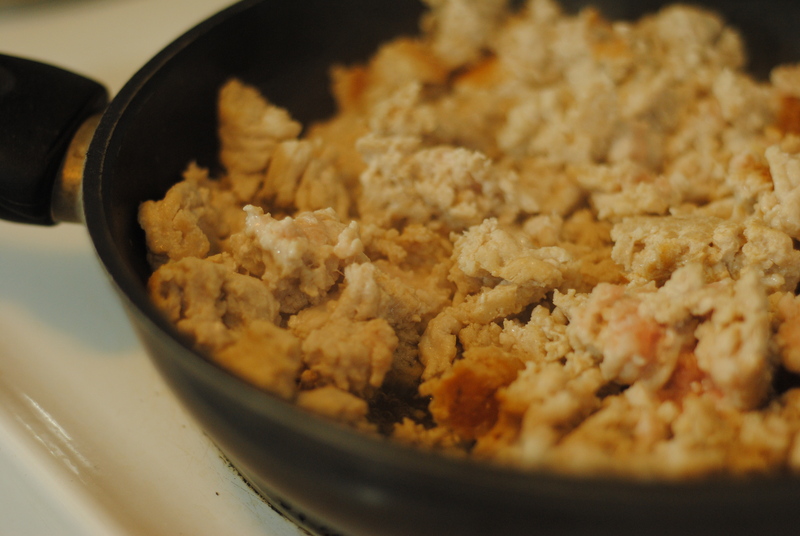 Use the bacon fat as flavoring. It would be marvelous. However, as with most of us low-amine eaters, that’s not a possibility. I am still pondering ideas on how to make a fake bacon that won’t be full of amines, but that’s a story for another day. 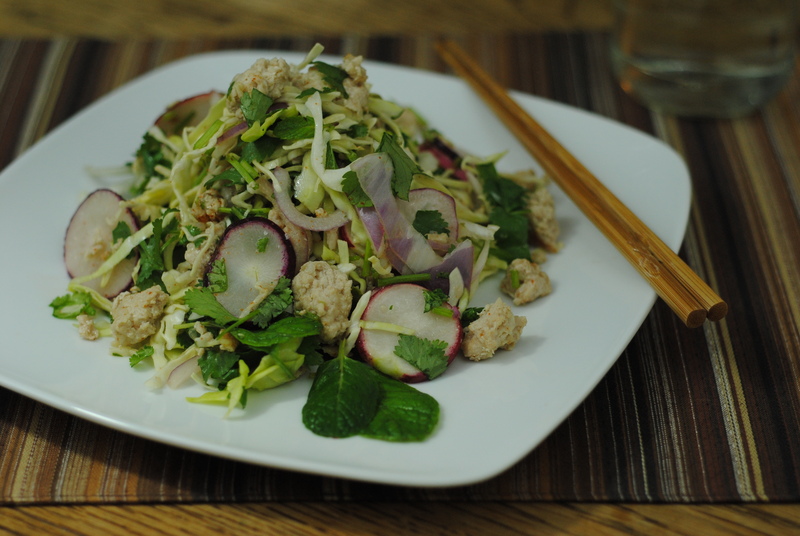 For now, a simple, easy recipe. Puree 5 chestnuts until very fine. 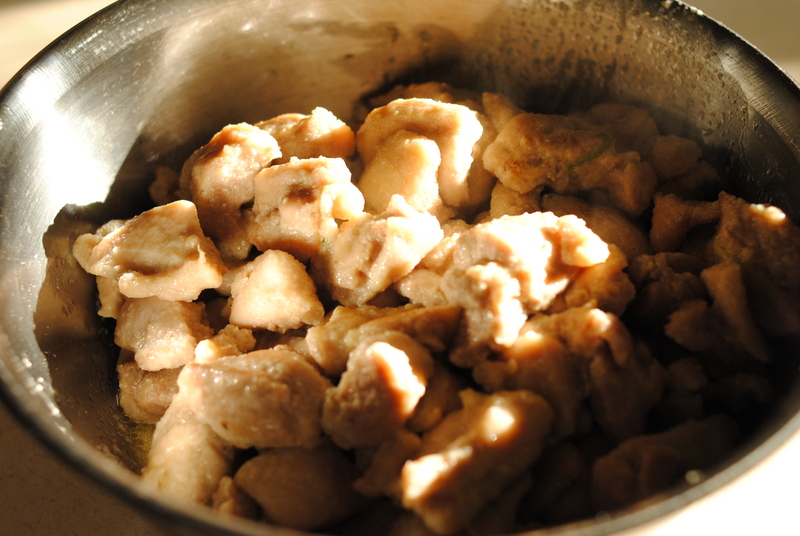 Add sugar and rice milk, and continue processing until smooth. 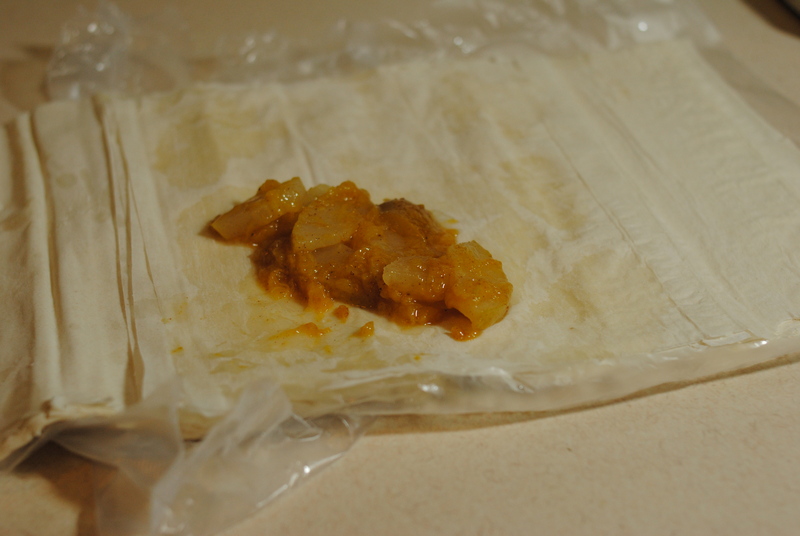 Pour chestnut puree into a small ziplock bag, seal, and set aside. Heat cast iron skillet to medium with oil. Add brussels sprouts, face down. Cook until browned, then toss. Continue cooking until almost done, about 5 minutes. 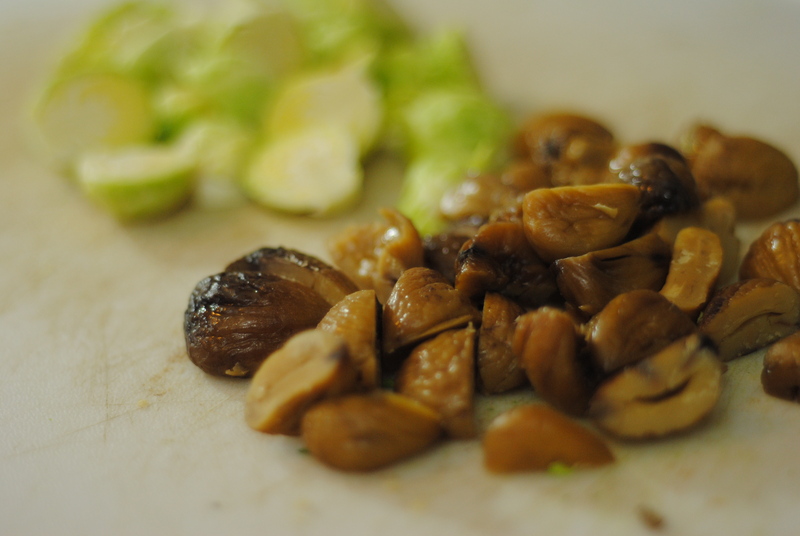 Add chestnut halves and cook (toss/stir as needed) until chestnuts are heated through. Grab serving plate. Snip tiny corner piece off the chestnut puree bag. Pipe a pattern onto the plate (or just serve sauce on the side in a small ramekin, if desired), then stack brussels sprouts and chestnuts on top. Crack fresh pepper over the top and serve. This recipe couldn’t be more simple, really. 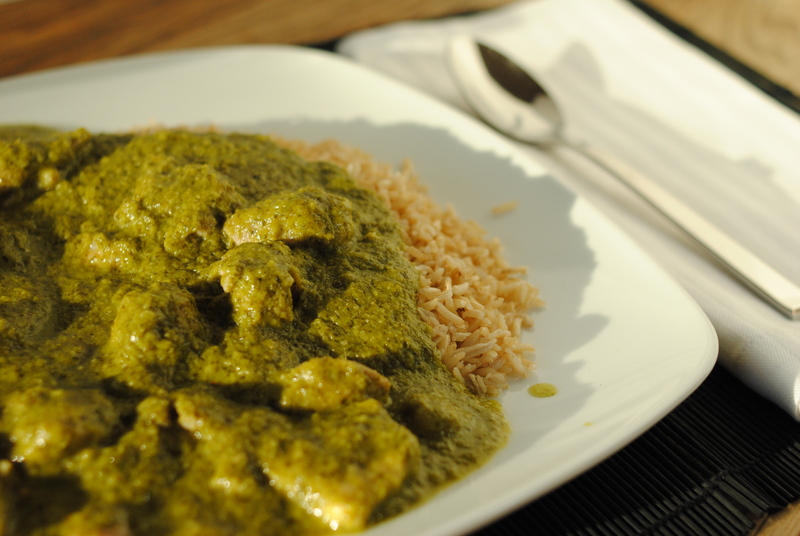 It is subtle, delicious, and tastes like a lot of thought went into it. Just the way I like it. 1/4 C chopped flat-leaf parsley (leaves only), loosely packed. Once beets are washed, and the stem-end is trimmed off (stem-end) often holds grit or dirt, so you’ll want it cut/shaved off. I shave off the dirt-collecting areas so that it wastes as little beet as possible. 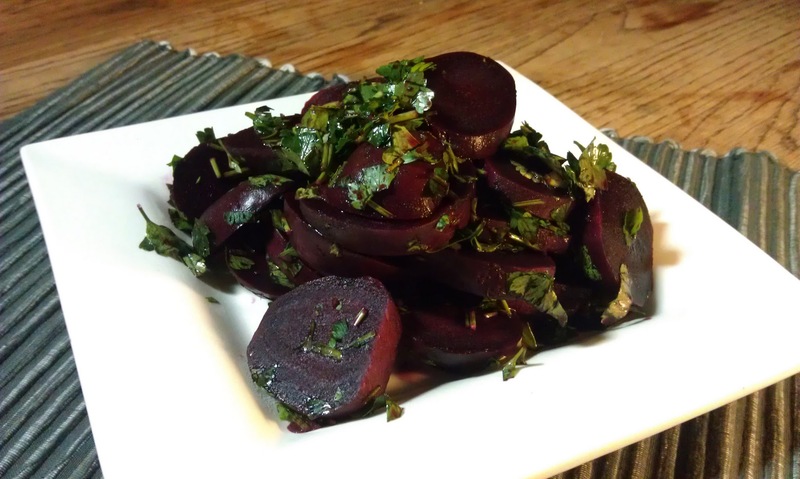 Do not cut the beets beforehand unless necessary to fit into the pot – the more internal surface area is exposed, the more sugar and flavor loss you will experience. Boil or steam beets for about 10-20 minutes, or until you can poke it through with a fork, but retains some of its firmness. If boiling, start from cold water so that the beets cook evenly. Drain beets and allow to cool. Once cooled, cut into slices and place in a serving bowl. Add all other ingredients and mix well. 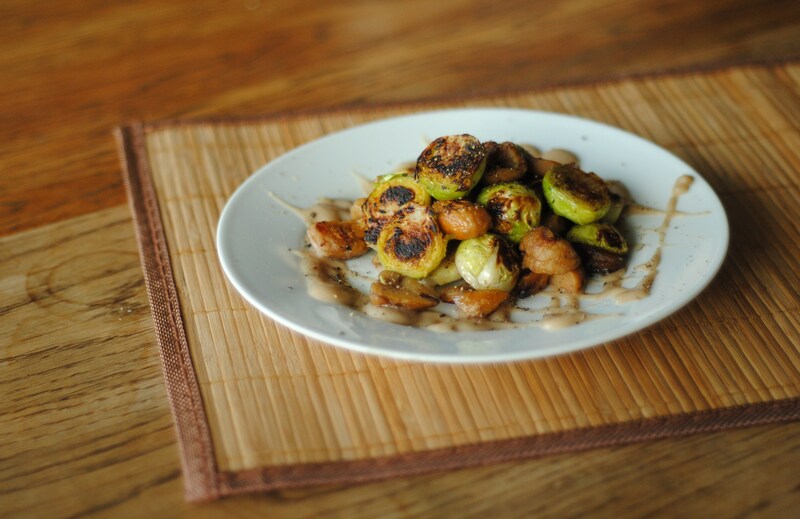 Allow to sit for at least 5 minutes to give them time to absorb the balsamic vinegar. Stir again and serve, or cover and refrigerate for later consumption.